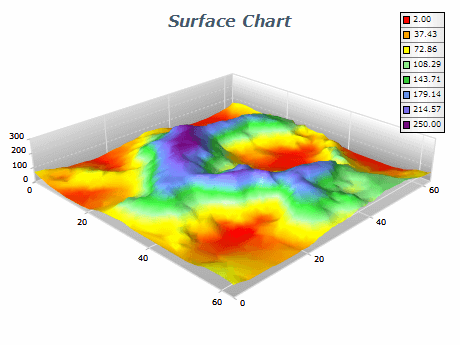 Triangulated Surface series can display a set of data points with custom X, Y, Z coordinates as a 3D surface. It is similar to the Mesh Surface series, the main difference being that the Triangulated Surface doesn't require the data points to be ordered in a network. The control automatically creates a triangular irregular network in order to render the surface. With the Triangulated Surface you can assign a custom color for each data point. Custom Colors can be used both for the surface filling and for the frame.